Since 2011, a considerable number of Italian politicians have started to use social media platforms, particularly Twitter, giving rise to a late Twitter Italian revolution in political communication. 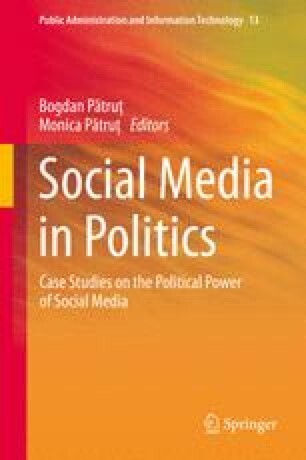 A specific research was developed to understand the concrete use of the new media and how politicians actually manage them. The study has analysed a sample of 41 politicians from the main electoral lists from September 2012 until April 27, 2013. Data collected have shown a mainly unidirectional and top-down use of Twitter that reproduces the traditional mass-mediatic logic of political communication. Chi, F. & Yang, N. (2010) Twitter in congress: Outreach vs transparency. Social Science Research Network (SSRN), (pp. 1–9), http://ssrn.com/en/abstract=1630943.